Shane Greene is getting sent to the minor leagues and because Shane Greene is not injured, this is bad news and not good news. Greene was acquired this offseason after an impressive 2014 debut despite relatively uninspired minor league numbers. He was gangbusters out of the gate, then got hit around, then was okay, then got rocked. Three good, four bad, three good, four bad. 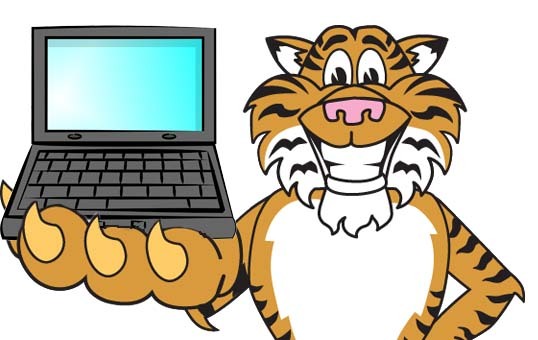 Shane Greene’s season as a Tiger. The word we’ve heard a lot is “hittable.” Greene’s walk rate is lower this year (good!) and his home run rate, even after the nightmare in Anaheim, isn’t that much higher than it was in 2014 when he was very good. His strikeout rate fell from 23.5% in 2014 to 15.1% in 2015. His BABIP is actually down, but with far fewer strikeouts, that equates to more hits overall even if the rate per ball in play is the same. So, in a nutshell, yes. Greene is more hittable. This isn’t batted ball luck or HR/FB% luck. Compare his swing, contact and zone rates for each of his seasons. He’s throwing more pitches in the zone, batters are swinging more often, and they are making more contact. That’s a bad combination. You want to either induce swings at pitches outside the zone to generate poor contact or to generate swings and misses in or out of the zone. He’s not succeeding in either department. It’s also telling that while he’s throwing more strikes, they aren’t quality strikes. Take a look at Bill Petti’s Edge%. 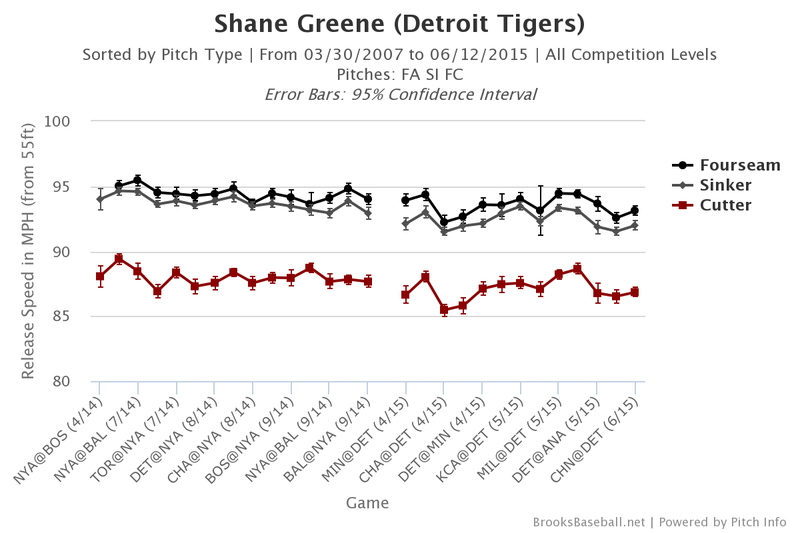 Shane Greene is throwing a lot more pitches in the heart of the plate. Before we look for the “why,” let’s also check to see if there’s a concern regarding decreased stuff overall. Greene’s pitches are going to different spots, but are they worse in terms of velocity and movement? It looks like his velocity is down a bit. If we look at movement, you can see some separation between his changeup and sinker and slider and cutter developing this year. The release point is elevated this year, but while Brooks controls for park effect, we don’t know how much he mound effects a pitcher’s delivery. Overall, it’s pretty clear Greene’s problem is too many pitchers over the middle of the plate. Perhaps the pitches have a little less deception and oomph, but it looks more like he’s catching too much plate than anything else. We can observe a minor release point change, but it’s also not drastic enough to feel totally confident about it as the cause. I think there’s a pretty obvious lesson here. For Greene to succeed, he needs to focus on getting hitters to chase rather than pitching to contact. Pitching to contact is not his friend. He needs to work away from the heart of the plate and get back to the zone coverage he had in 2014. Especially against lefties. Lefties are killing him, to the tune of a .406 wOBA. He wasn’t great against them last year, but this is a 60 point increase compared to a 2 point increase versus righties. This just about says it all. Pitch location to lefties, last year and this year. Greene needs to avoid the zone and he needs to do so especially against left-handed batters. Righties are putting the ball in play plenty, but not with the kind of authority that lefties do. He’s got to work on his command. It might be a game plan issue or it might be physical, but to get a useful Greene back in Detroit, he needs to get a little less hittable.